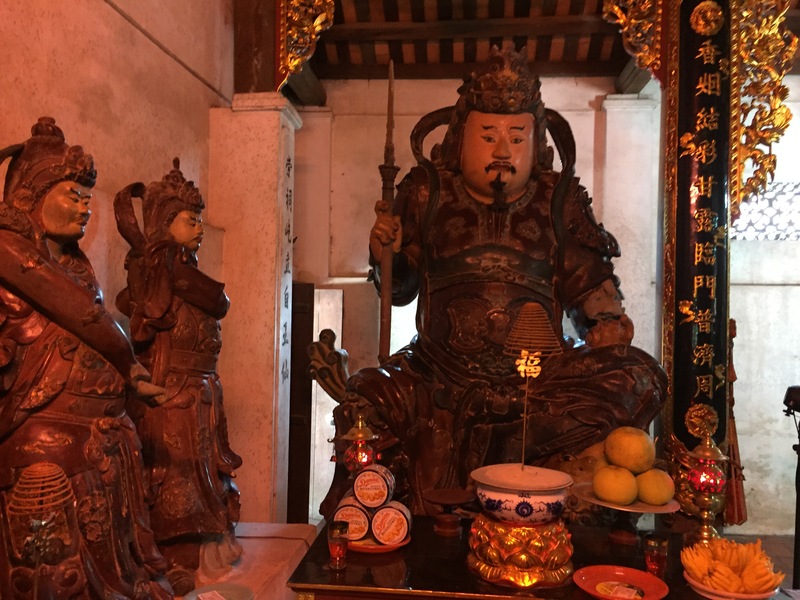 The Goddess of Mercy, Guanyin at Chùa Dâu. 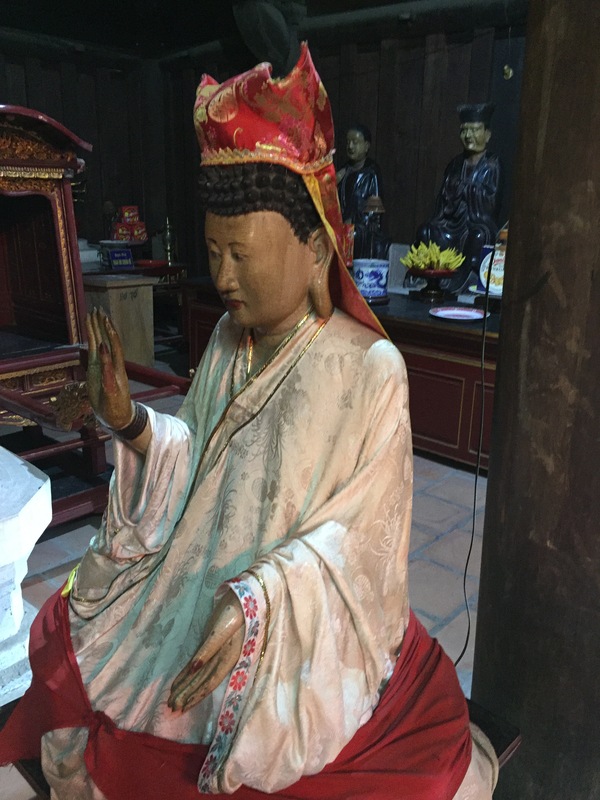 Before Jan and I ever set foot in Việt Nam, we began our journeys to Southeast Asia in Los Angeles with our own Guanyin, acupuncturist Loi Trinh Le, who lived in Culver City off of Venice Boulevard. 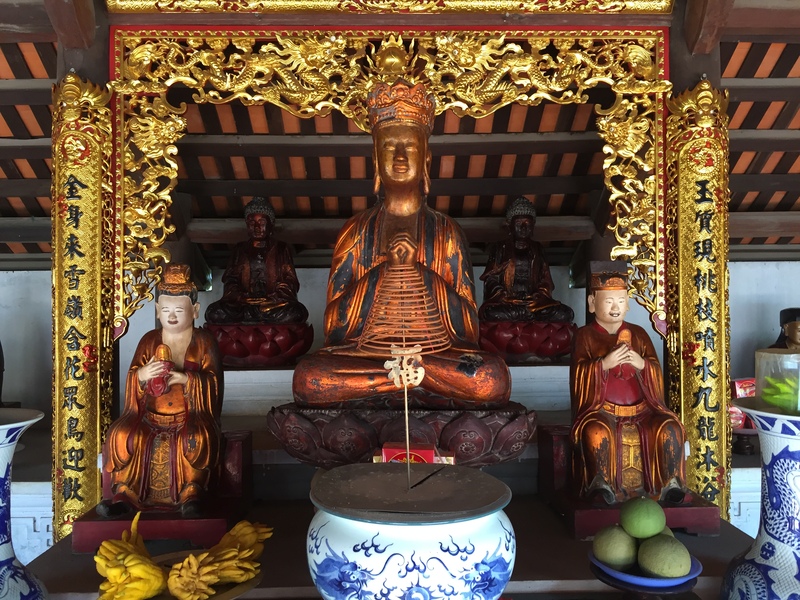 A bodhisattva in Mahayana Buddhism, Guanyin means “The One Who Perceives the Sounds of the World.” No wonder Loi Trinh Le emphasized her to us. I’ve purposefully left out the essential diacritical marks of Trinh’s name in Vietnamese. I can’t bring myself to pronounce her name correctly in her language, which would approach “ching” in English. She remains a bridge between cultures in my memory, and that decision maintains an adamant position even as my Vietnamese improves. I can still hear her soft voice, tinged by her French accented English, saying quickly “hi, hi, hi” upon picking up the telephone. The last time I saw her for an acupuncture treatment, she had set up a table in front of her family altar. At the time I didn’t know she had cancer and it would be the last time we would meet. A sweet incense filled the room and I can still remember her hand measuring my pulse, for what was to be the last time. Trinh had inserted a few needles deep into my skull. 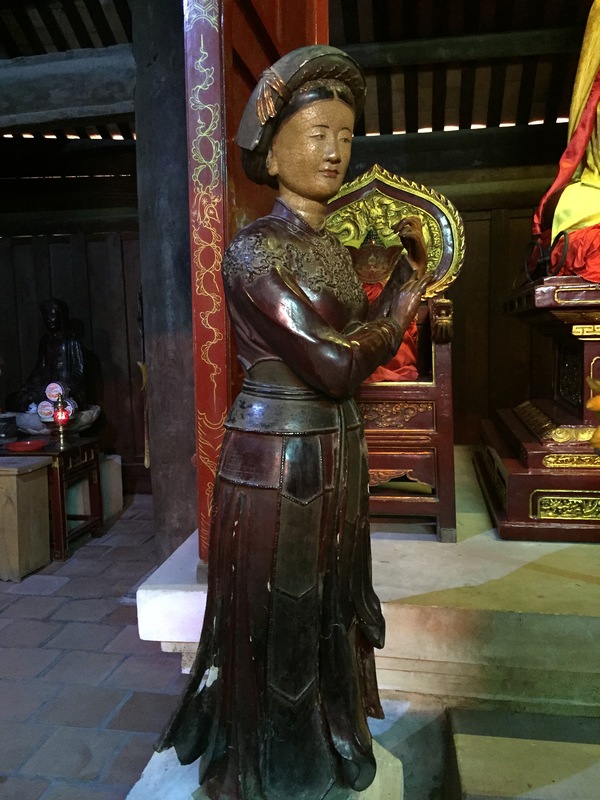 Loi Trinh Le found me again at Chùa Dâu, the oldest Buddhist temple in her beloved Việt Nam. Or maybe I found her again. Spirit flags floating in the wind at Chùa Dâu. 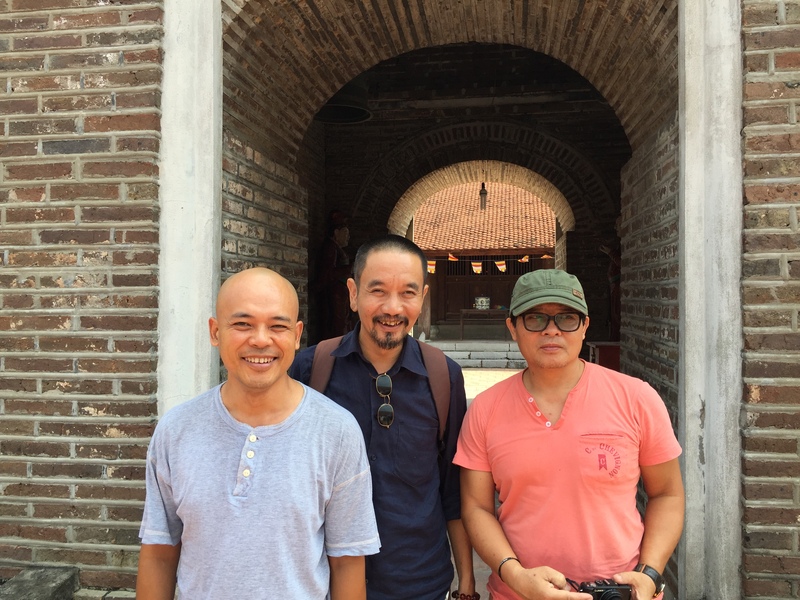 And so our trip to Chùa Dâu involved new friends Đàm Quang Minh and Vũ Hoà. 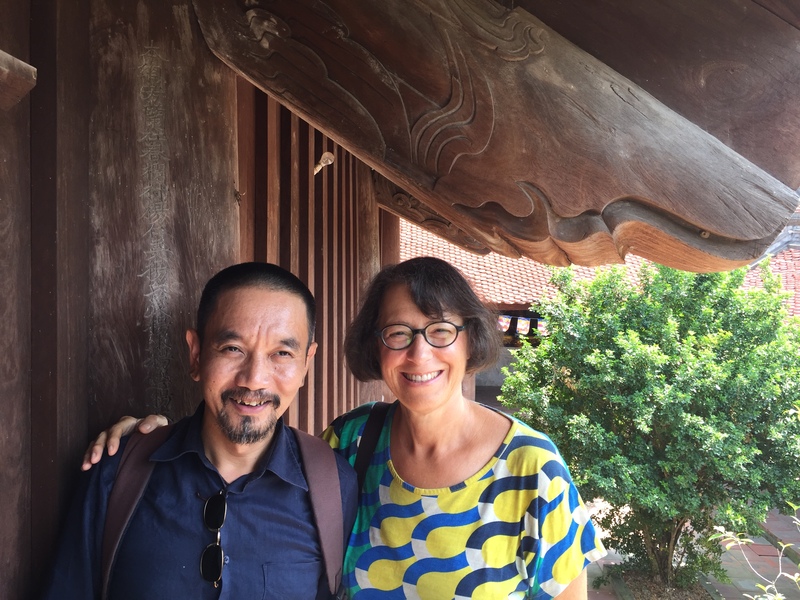 They both divide their time between Paris and Hà Nội, so, at long last, Jan and I were spending a day with French accented English, which made memories of Trinh come alive. Nothing is random. We divide time into past, present and future. Here time is global. I suspect our friends knew that Jan and I were ready to see the real Việt Nam as they sandwiched everybody into the car for the day. Vũ Nhật Tân, Đàm Quang Minh and Vũ Hoà. 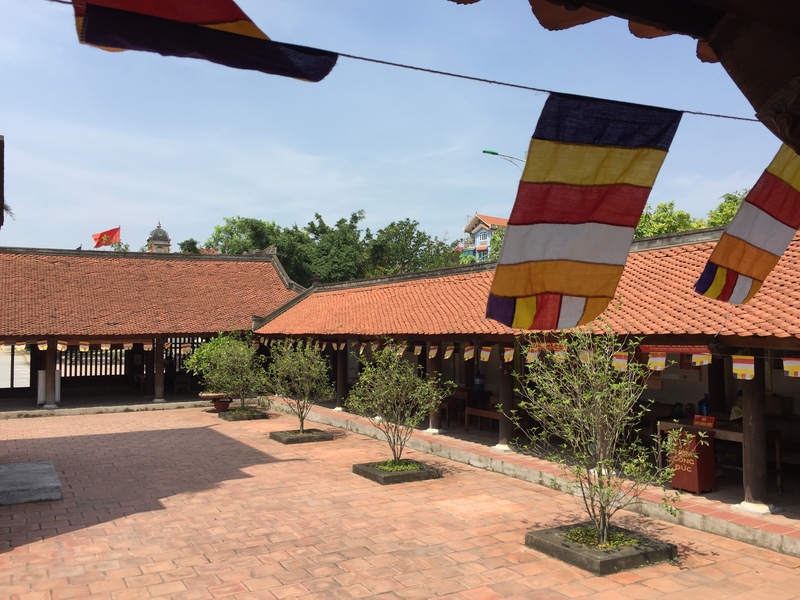 As I mentioned in my last post, our day in Bắc Ninh would be framed by seeing the oldest and newest Buddhist temples in Việt Nam. 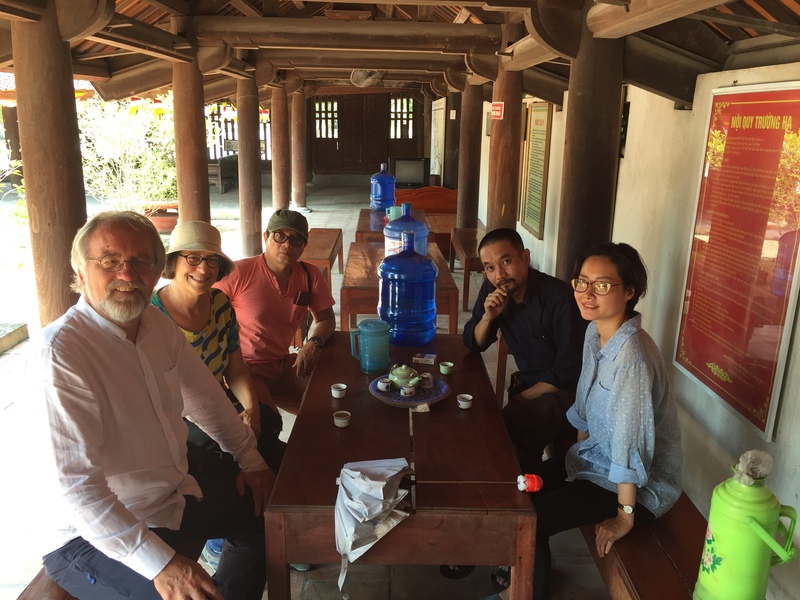 The metaphor was clear, as our background discussion involves long term collaboration between the Ancient Music Ensemble of Tonkin and the Hà Nội New Music Ensemble. Đàm Quang Minh and Vũ Nhật Tân direct the Tonkin group, and Tân is part of the leadership of the Hà Nội New Music Ensemble, so the energy is one of cultural family. 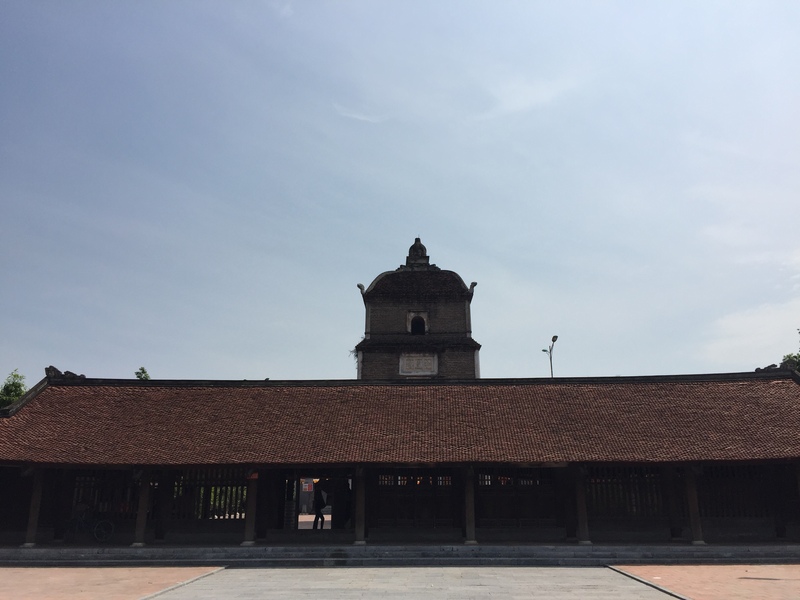 Upon entering the inner courtyard of Chùa Dâu, you pass into a bell tower. The temple’s location is striking. Unusually situated on a flat plain, a typical worker bee street environment provides a practical approach. When we arrived, we had no inkling of what to expect. 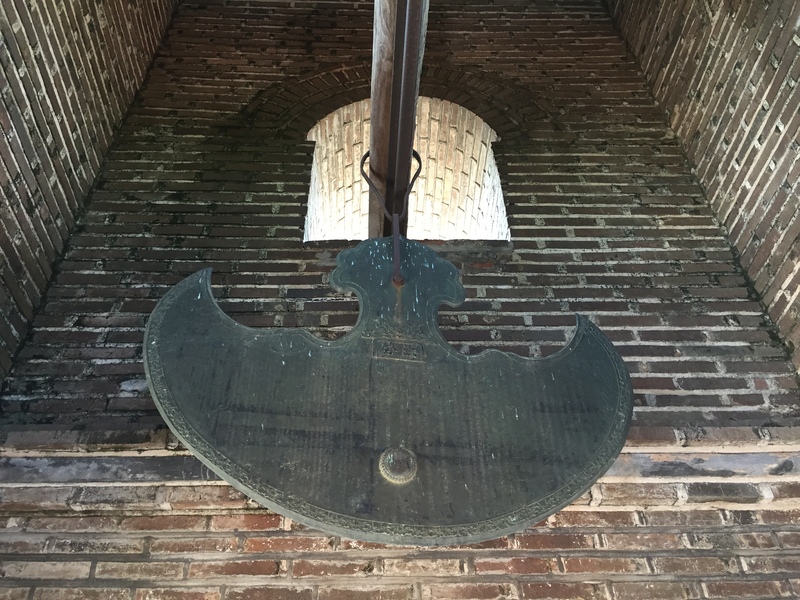 A mammoth flat gong in the Chùa Dâu bell tower. 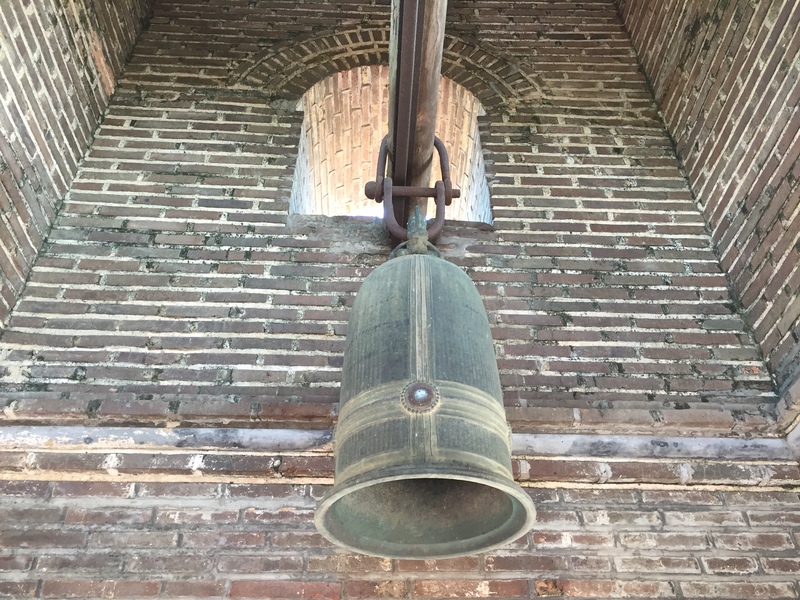 A resonant 3000 year old temple bell. Survival is an active metaphor in Việt Nam. 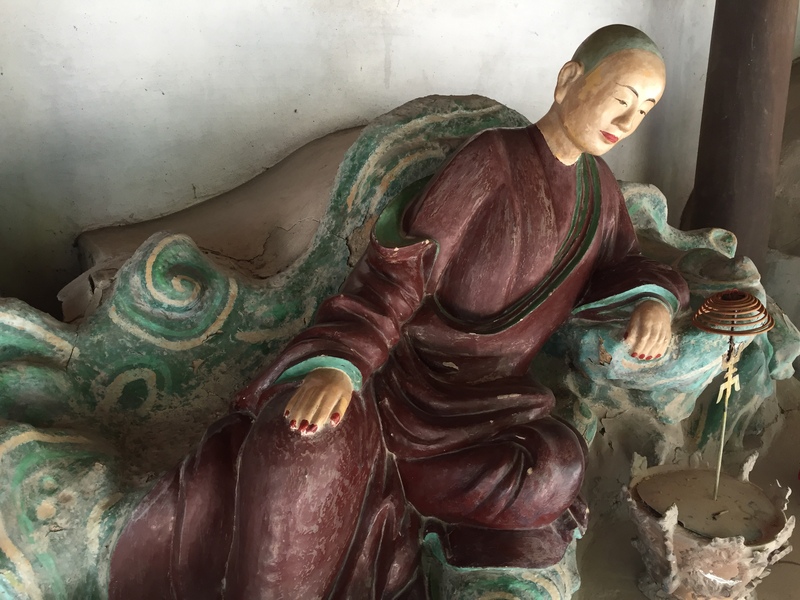 To have reached 3000 years of longevity in this country, Chùa Dâu has witnessed endless struggle and war, and survived it all. Just like the Vietnamese people who revere the grounds and continue to worship here. As I discussed in my last post, the blur between China and Việt Nam is profound, contradictory but also undeniable. Finding the real Việt Nam? Chùa Dâu provided us with the best lesson of our lives. 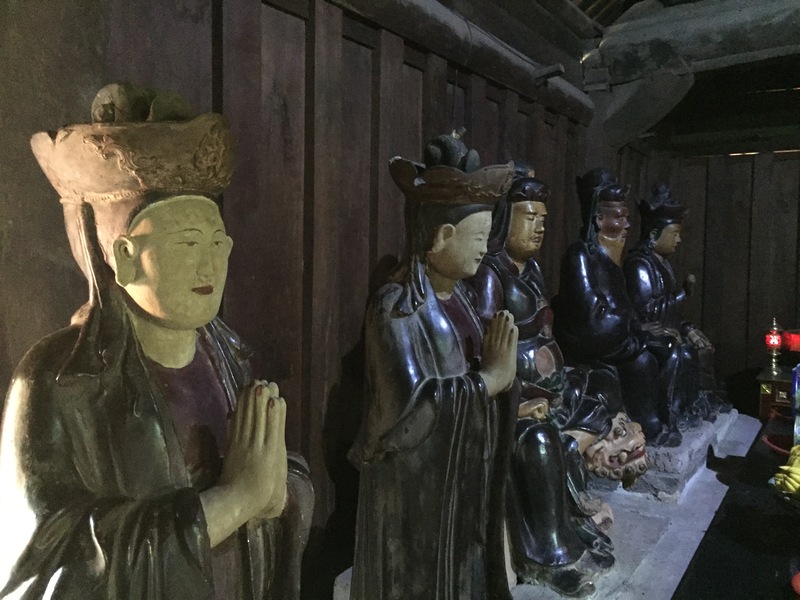 The most inspiring aspect of the temple are the numerous wooden statutes that decorate the side altars and perimeters of the temple complex. They are of exquisite beauty. And are exquisitely Vietnamese. 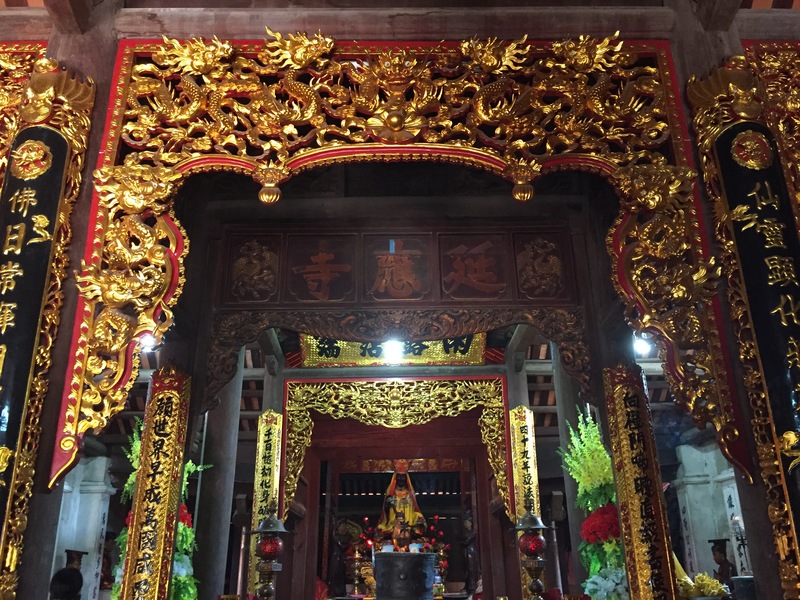 The main altar at Chùa Dâu. 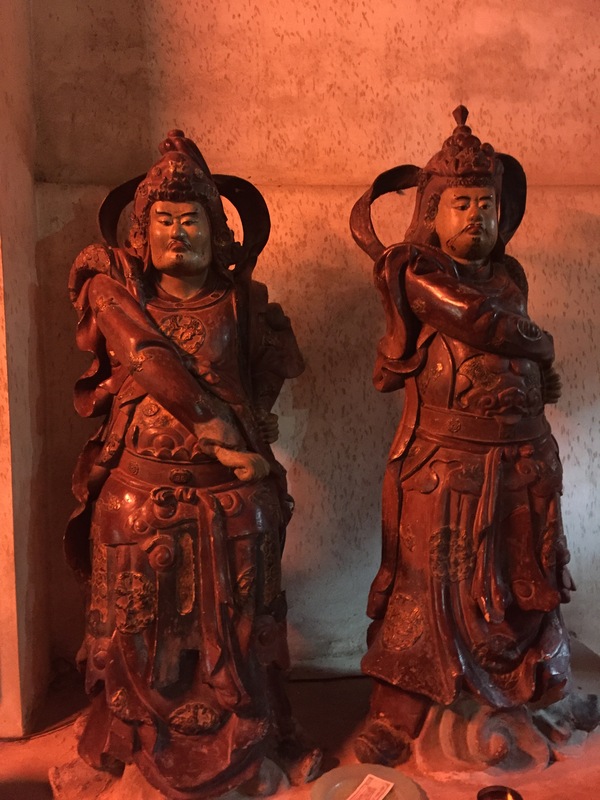 To either side of the main entrance altar, you will encounter large statutes representing Good and Evil. 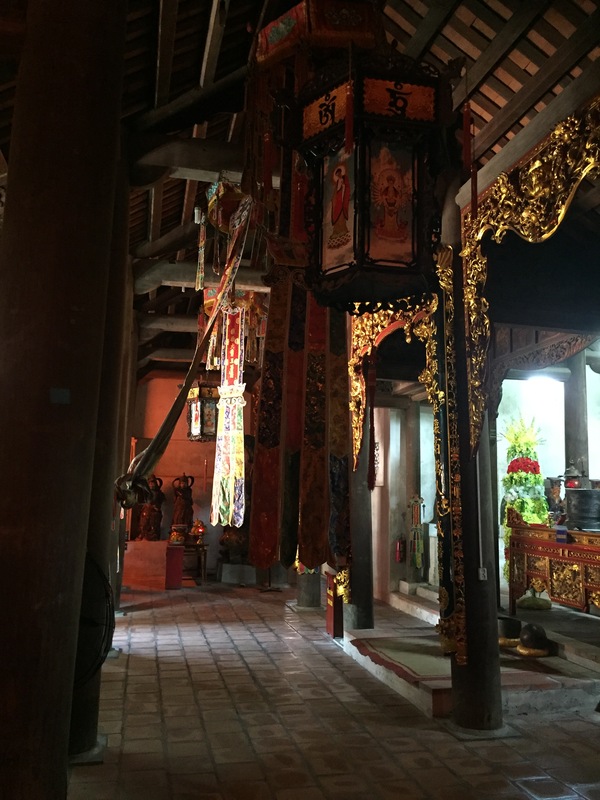 Not only are they imposing, but the hue and color is unique to Việt Nam. The calligraphy is not Chinese but ancient Nôm, the vanishing calligraphy of the Vietnamese being preserved by essential scholarship. 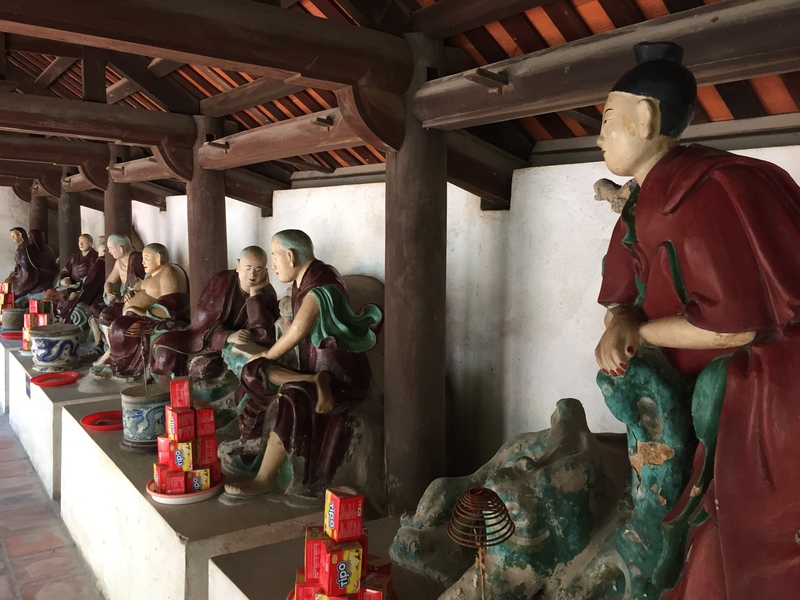 Guardians of Good at Chùa Dâu. A vertical look at the Guardians of Good. 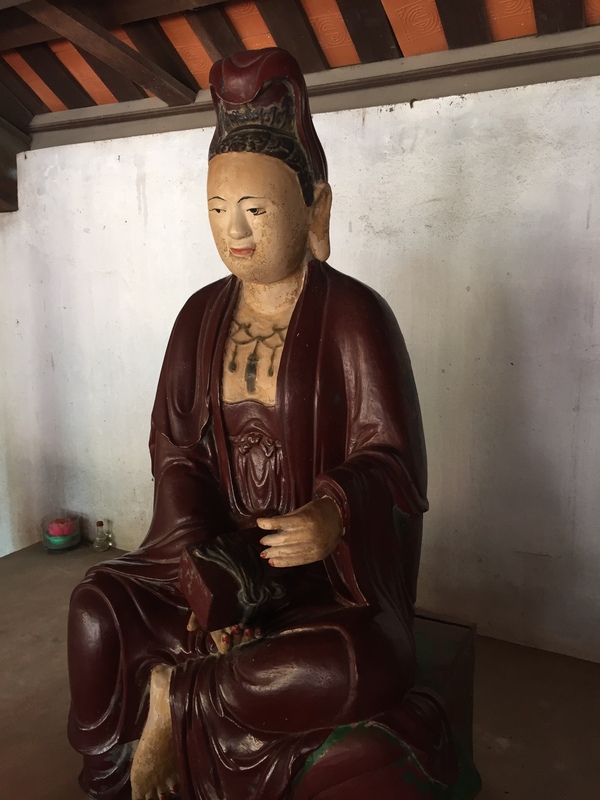 The God of Good Things at Chùa Dâu. And this is just the beginning. 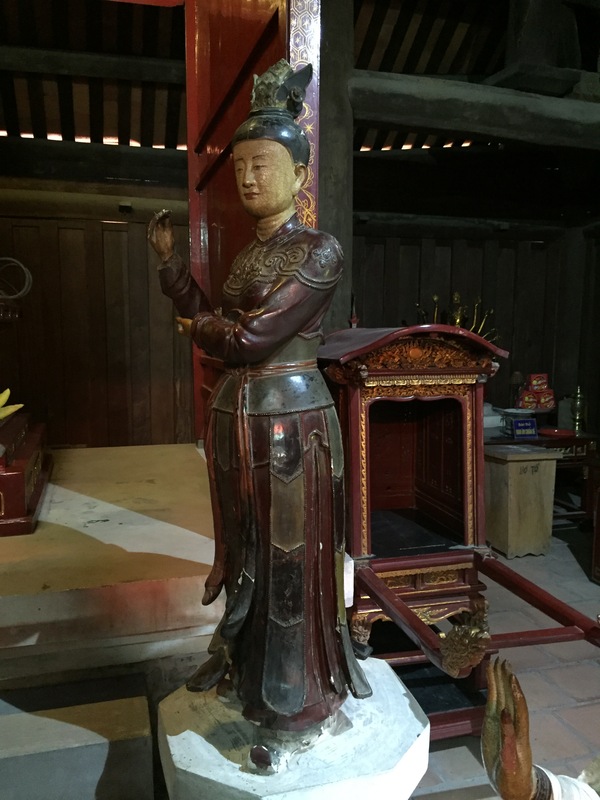 I have never, ever, in my experience throughout Asia, in Japan, China, Taiwan, Thailand, Cambodia, Singapore, or Malaysia, seen statues like the following photos will demonstrate. The sheen results from the marble being finished with a wood covering, resulting in a shining wood that needs to be seen to be believed. So start believing in the real Việt Nam, a Mahayana Buddhism that is not at all Chinese in profound ways. An inner glow at Chùa Dâu. 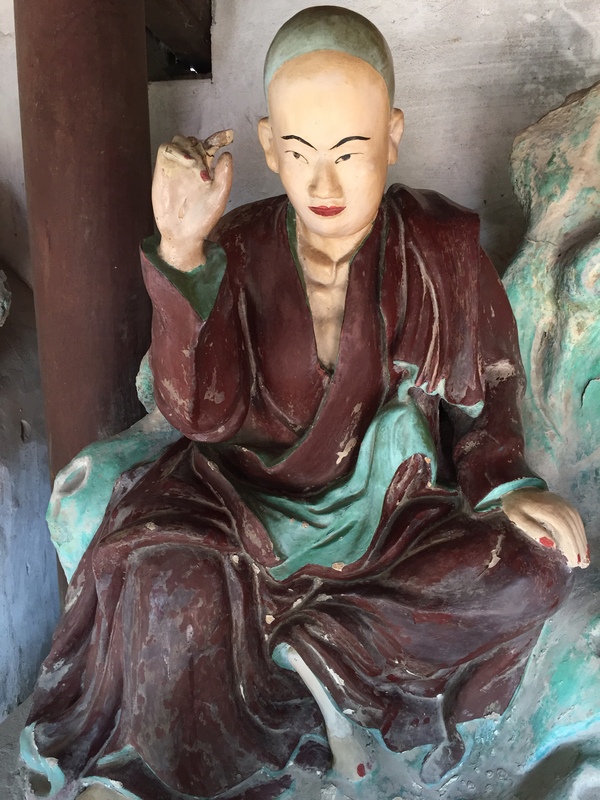 A monk deep in meditation. 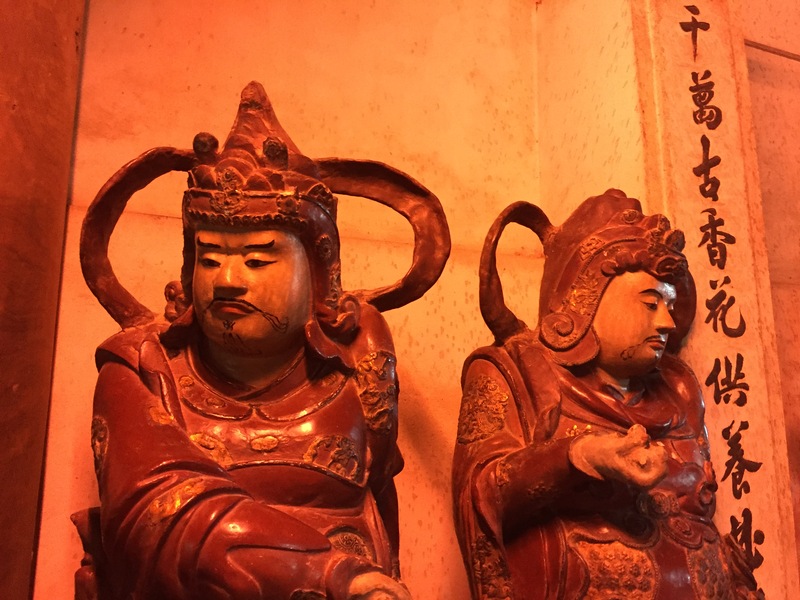 A red and white Guanyin. 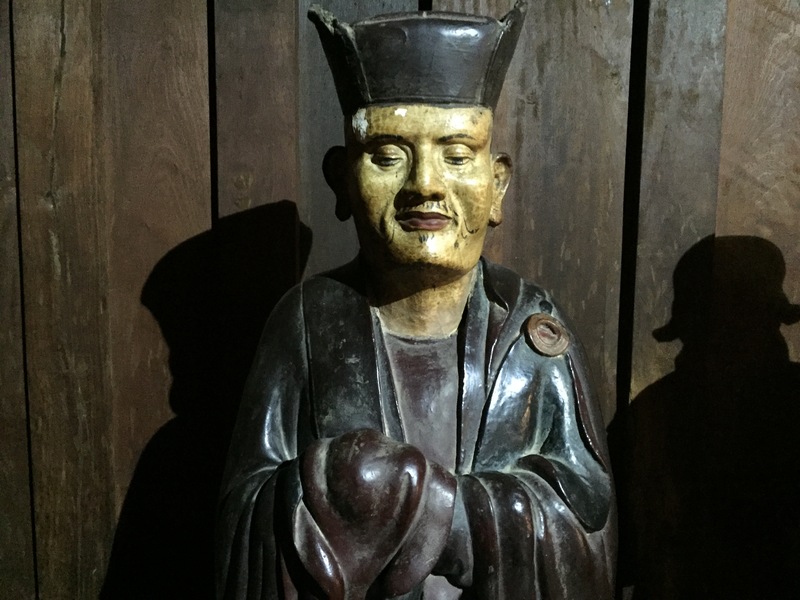 As we walked around the altars, Minh answered all of our questions with ease, and my French was good enough that we could understand his vast expertise about his home country. The old wood work of the temple was deeply significant for him and he was anxious to point out the 3000 year old vintage to Jan and me. Minh and Jan surrounded by the warm 3000 year old wood of Chùa Dâu. We then walked down some steps to observe the surrounding perimeter. Buddhist temples are always in layers, and that design is usually a measured out mandala underneath the actual building. Lining the perimeter were reconstructed statues of various Buddhas and traditional poses, but again the design and structure emerged as truly Vietnamese, innocent being my operative word. Quite a feat for a country that has found itself in the cross hairs of China, Japan, France and the United States. A statue gallery is found around the perimeter. A reclining Buddha approaching a gentle nirvana. 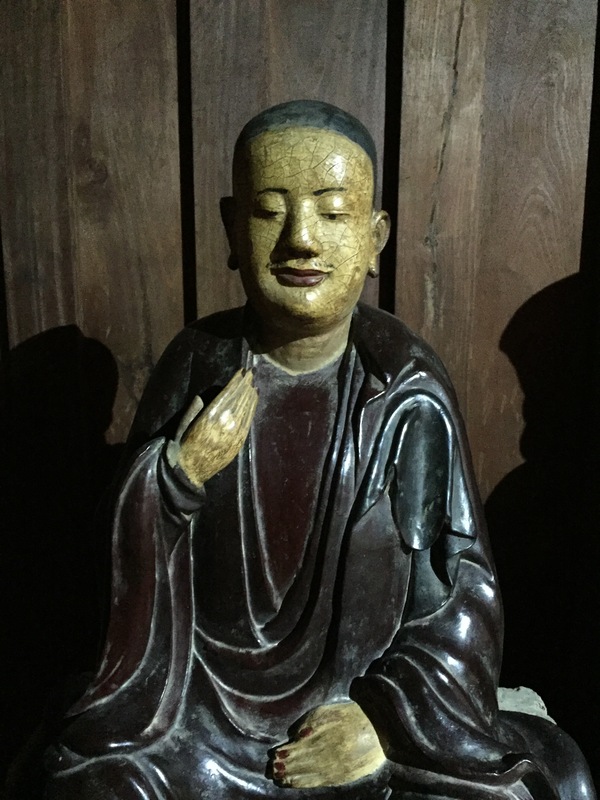 Another Buddha in meditation with a welcoming hand signal. There are numerous side altars around the perimeter. As our visit was winding down, we stopped to have some exquisite Vietnamese green tea. I wish English had a better word than “bitter” to describe many tastes found in Southeast Asia, a word which is for me not entirely convincing to convey the delicious bite that many sensations have on the tongue here. But the tea is strong and perfect for a pick me up. And a tea shop is rather common on temple grounds here. Nothing is better than conversation and tea with friends. And so we discussed many topics, but behind all the conversation was the gentle memory floating on the breeze and in the ubiquitous incense infused air of the temple that Loi Trinh Le was once again truly at my side. I could hear her voice whispering “wonderful!” In my serviceable French, I’d told Đàm Quang Minh about her and his equally soft voice helped bring her back to my heart. She chirped once more in my heart and we set off for Bắc Ninh. 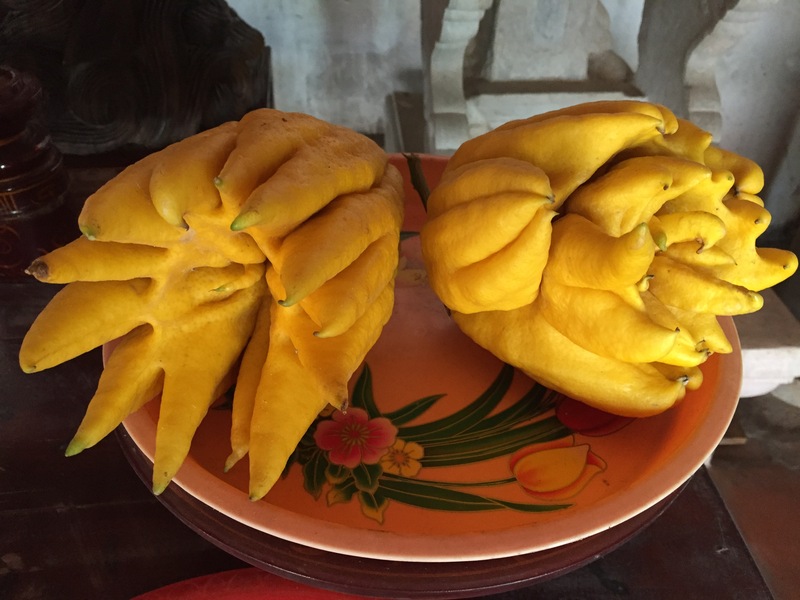 Buddha hand fruit are an excellent offering at Chùa Dâu.